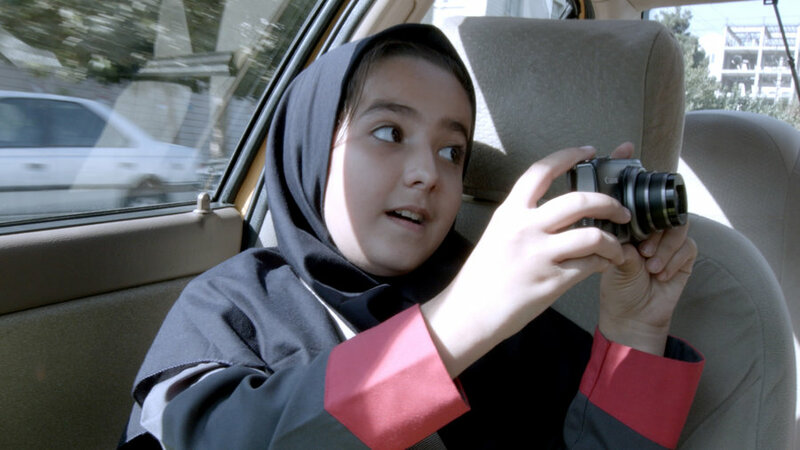 Jafar Panahi’s Taxi is not a violent film. No acts of violence are depicted in the film, but violence permeates and informs the film. 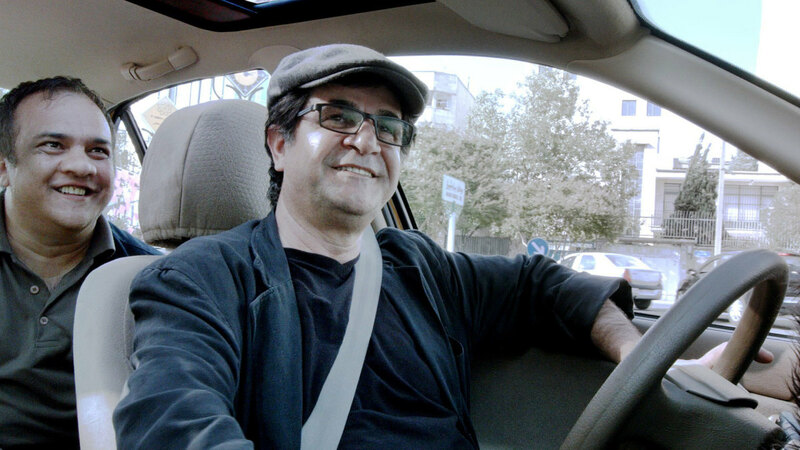 Conversations and off-screen acts paint a portrait of how violence intrudes into Jafar Panahi’s sheltered world as a cab driver. As he drives around Tehran, Jafar finds his passengers bring in the baggage of violence. Take the first passenger, a man who goes off about how a relative recently had his tires stolen. He says a couple of thieves should be hung as an example to the others. 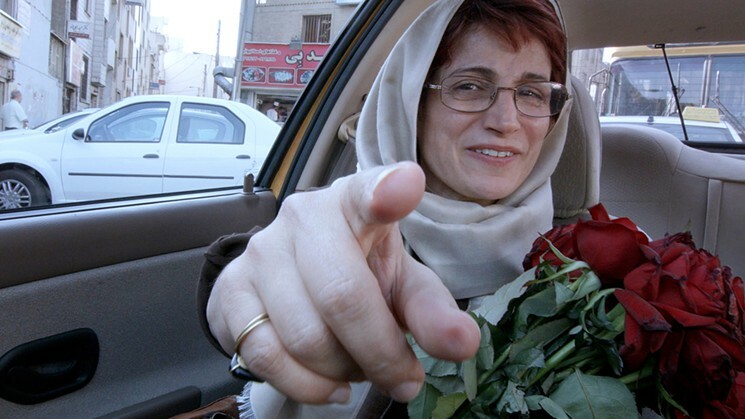 A woman who rides as another passenger in the back seat takes offense at this suggestion and tells the young man that Iran is second only to China as the country with the most executions. Jafar seems content to let the two hash out the argument. Jafar isn’t quite as passive with the next set of passengers. He pulls up next to a motorcycle accident and the victim and his weeping wife. Panicked that he might be dying, the victim asks to be recorded as he gives his last will which leaves his house to his wife, worried that his brothers will take it otherwise. Later on his route, two older women insist Jafar drive them to a spring, saying their lives depend on it. They bring with them two fish in a glass fishbowl. When Jafar brakes abruptly at one point, the bowl shatters and the fish are left gasping for air. The fish are unseen until Jafar scoops them up and places them in a sack of water he retrieves from the trunk. Jafar’s next passenger is his young niece that he picks up from school. She goes on about how she needs to make a film for a class, but how it must adhere to certain rules, complaining that she doesn’t understand one rule about making a film which contains gross realism. His niece also talks about footage she captured of a suitor being beat up by the brothers of his beloved because they find out he’s an Afghan. Their conversation about filmmaking is interrupted when Jafar meets an old friend. This friend hands him a tablet which contains violent footage of a crime he was a victim of. The friend is still shaken by the event, but does not want to report the crime because he knows the people involved and doesn’t want them to be punished. All these moments relate to violence in some way and build together a tapestry of social unrest in Tehran. The woman against execution, the victim of a random accident willing his house to his wife, the unseen footage of a suitor being beaten up for being another race, and the footgate of an unreported crime all show various social pressures at work in the country. Through it all, Jafar’s taxi becomes a sort of safe space for its passengers. Jafar often aids them or is simply content to let the circumstances play out with a smile on his face. Once in the car, a safe space is gained to think and talk about the outside world, one with no condemnation or criticism, Jafar as a director/actor positions himself first and foremost as a listener, even as his passivity infuriates some of his passengers. Jafar may be the driver, but he’s quick to leave his passengers to come to their own conclusions instead of leading them into his way of thinking. The image left is less than flattering, especially when taken with the interesting final moments of the film. The social ills of Iran are lain bear, positioning the film quite nicely into Jafar’s body of work. Social issues are depicted through unseen violence that make the film deceptively silent, but secretly rioting against the ills of Jafar’s home country.